An incredible sense of accomplishment achieved by all! 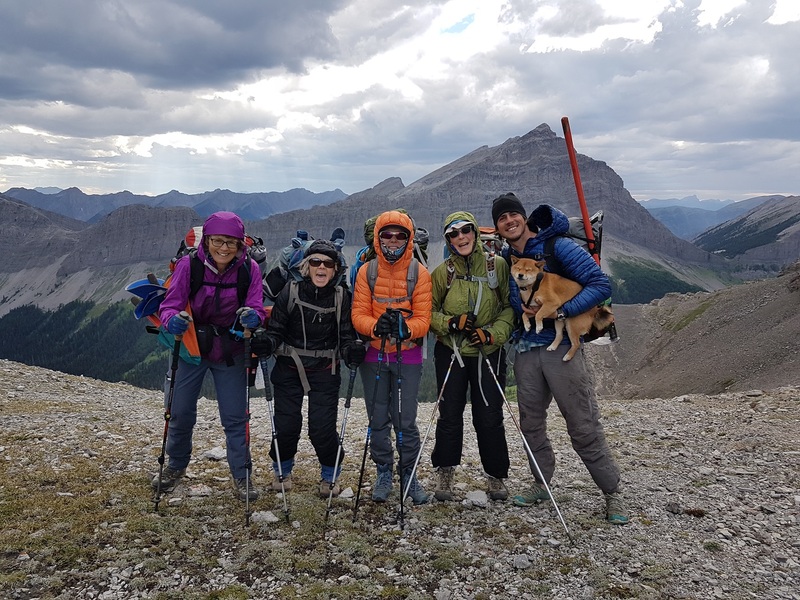 High Rock Trail Trips: 7 trips on the High Rock Trail took place between June and September, including two bridge building trips and the first Crowsnest Chapter trip. 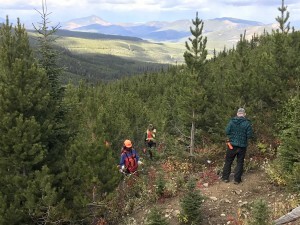 This was Year 3 of construction on the High Rock Trail, the new section of trail being built between Crowsnest Pass and North Fork Pass to move the GDT off the road, away from the Line Creek Mine and onto new single track trail. 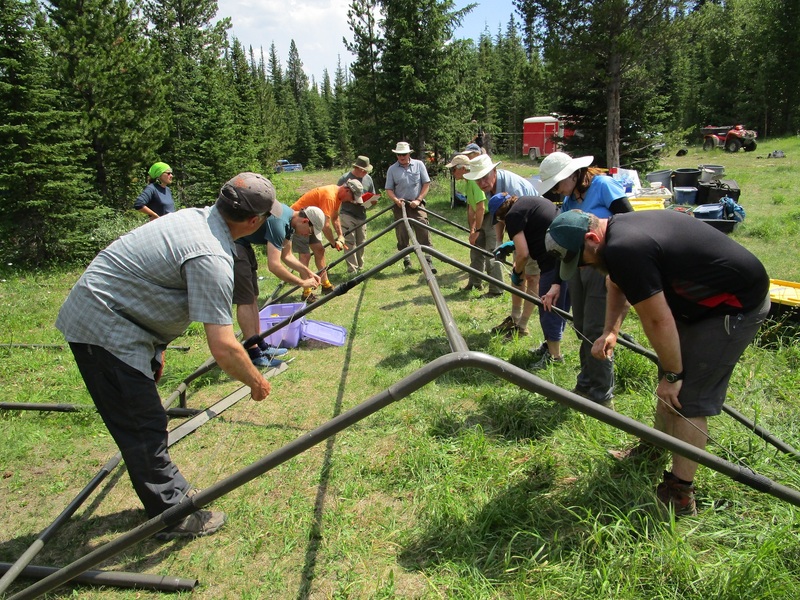 Two separate crews participated in what we call “Hybrid Trips” between June 18 to 28, completing tread building on Section C. A Hybrid Trip offers a scaled down camp and kitchen set-up, with a more independent camp experience as volunteers bring and cook their own food. This year the Alberta Occupational Health and Safety guidelines were updated for the first time in many years, causing a mild panic for volunteer organizations throughout Alberta. 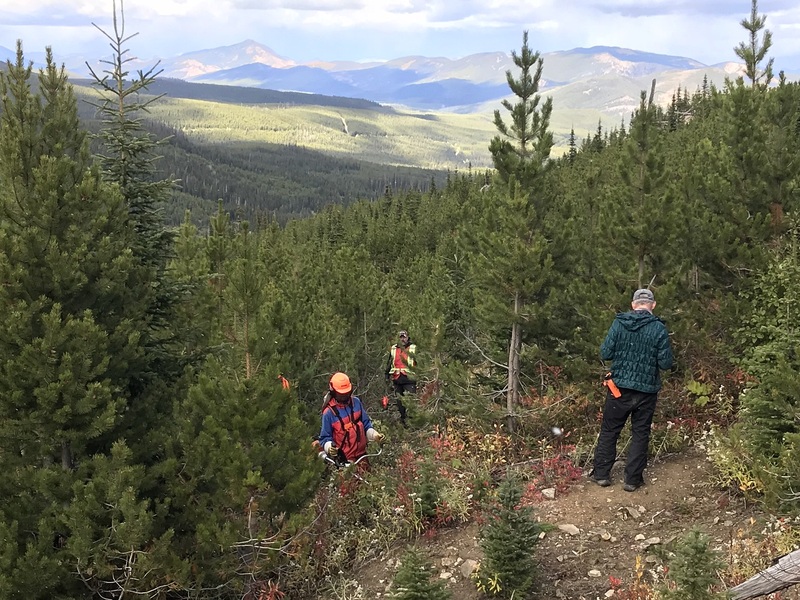 With a hard deadline of June 1st to comply to these new strenuous guidelines and operating procedures, our dedicated team worked countless hours to build on a safety plan that the Greater Bragg Creek Trails Association had implemented. Thanks to the hard work of several volunteers, we were able to meet the new safety requirements and our approval came as we drove out to the camp. 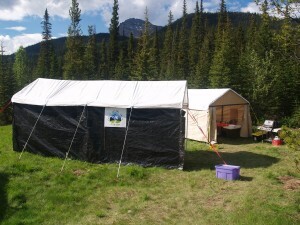 The crew arrived at the Dutch Creek base camp on June 18 and set up tents, cooking and dining shelters, preparing for the next few days of trail building. After camp was set up, the crew gathered in the cooking tent to discuss the new safety plan and review tool use and safety procedures. 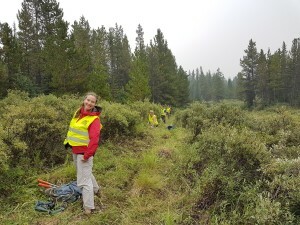 Although the weather started off nice, the last few days of the trip were challenging in the pouring rain, but the crew worked hard to finish the tough stretch of tread work on Section C.
At the same time about 5 km north of the Dutch Creek base camp, a Bridge Building Crew was working on the longest natural log bridge on the GDT. 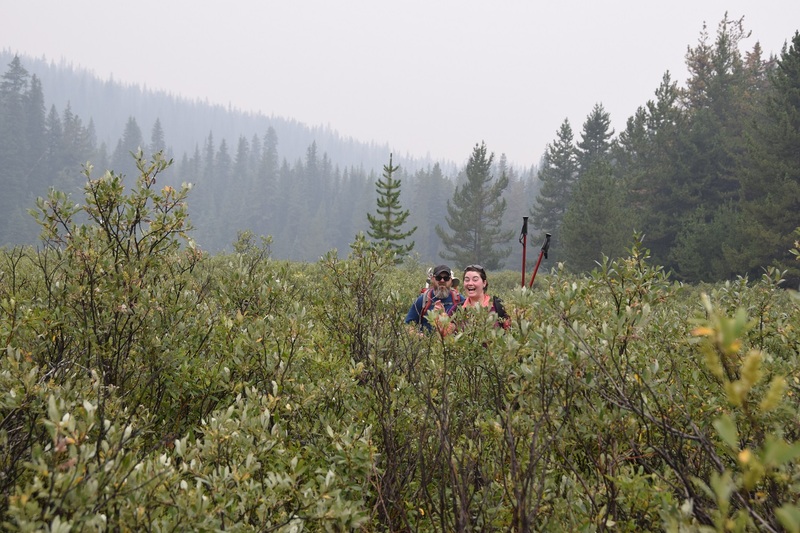 They were also tasked to flag a route around a large avalanche debris field across the trail. This needed to be done before this year’s hikers were to pass through. On both crews last day, they ran into a few mechanical problems and poor weather which resulted in returning home later than planned but all were happy and proud of the work they had accomplished. 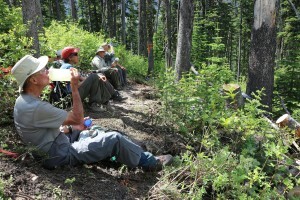 July brought nice warm days and two back-to-back Signature Trips on the High Rock Trail. Signature Trips showcase how much fun it is to be involved with the GDTA, creating a safe learning opportunity for new volunteers. Signature Trip base camps offer an enhanced camp set-up that includes full backcountry kitchen facilities, a privy and a solar shower. 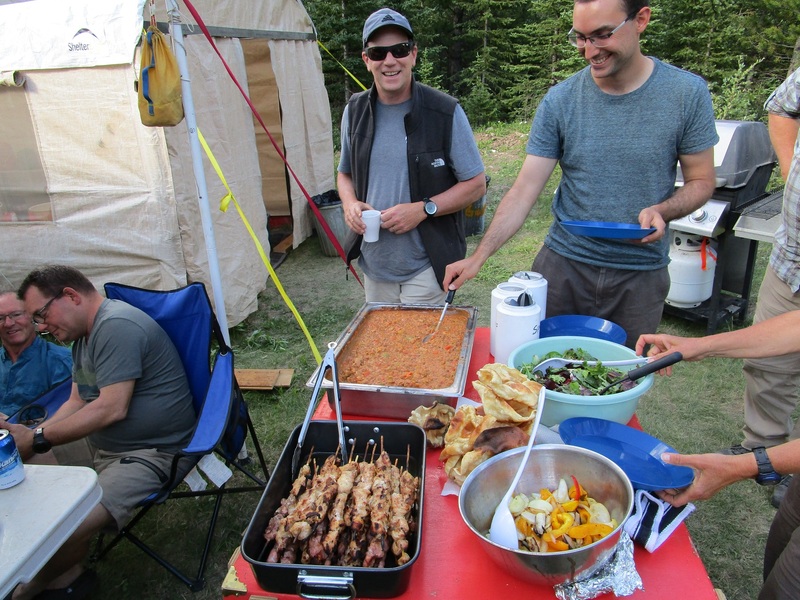 On Signature Trips, all food is provided and meals are prepared by a head cook – quite the luxury in the backcountry! 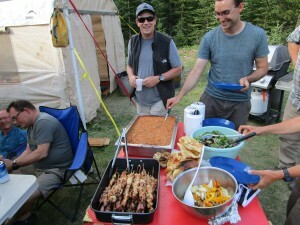 On the crossover day between the two Signature Trips, the Walking Trip crew also arrived at camp and a group BBQ lunch with all 3 crews took place. 42 hungry volunteers set a record for most people at a GDTA camp at the same time. Again, a renewed attention to safety was paramount and extra time was taken to review safety procedures and practices. 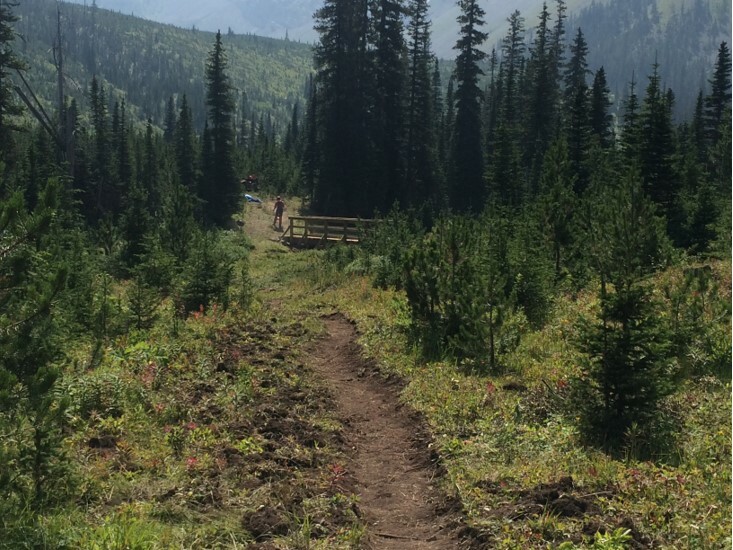 The goal of the Signature Trips was to start building trail in Section E, south of North Racehorse Creek. 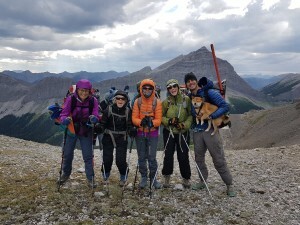 The first Signature Crew endured a heat wave as they blazed a new trail up the steep slopes of Domke Ridge. 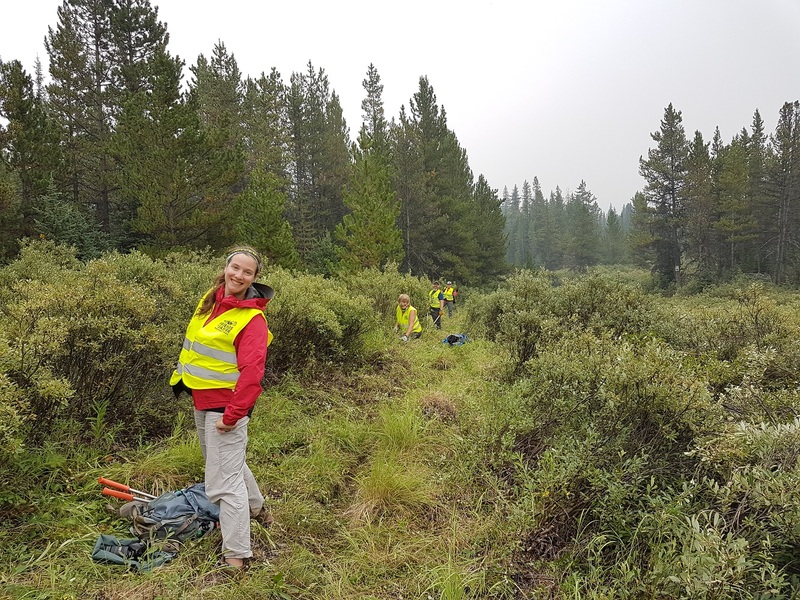 The second Signature Crew continued clearing the corridor and building new tread, and in addition to the heat they dealt with afternoon thunderstorms which made for some slippery slopes. 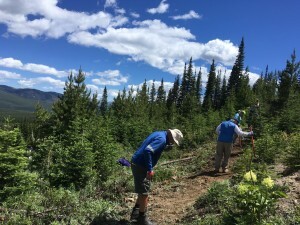 These challenging conditions slowed trail construction slightly but the Signature Crews still built more than 1 km of new tread and cleared 2 km of trail corridor, almost to the top of the ridge. 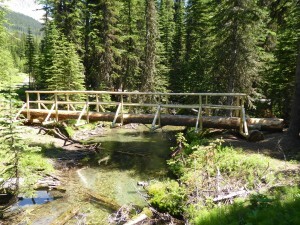 August brought even hotter temperatures, and another Bridge Building Trip. 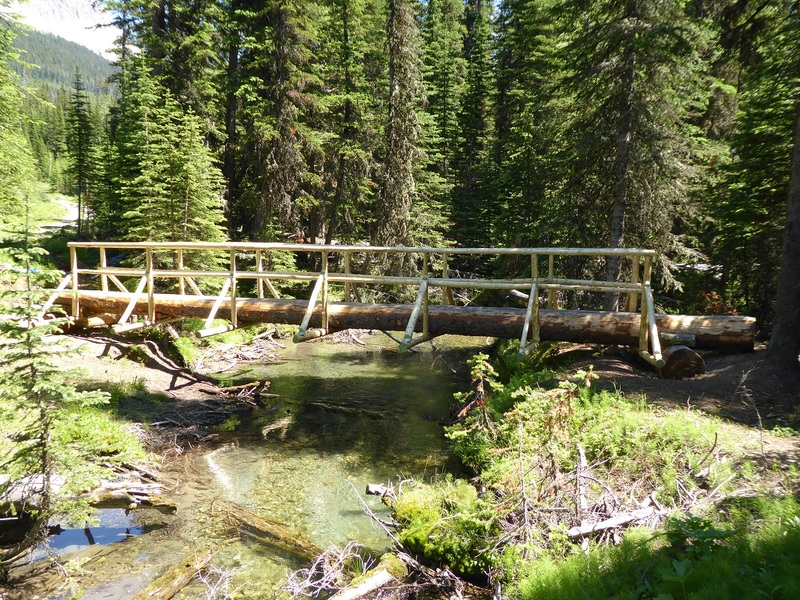 First Creek Bridge was engineered and installed with the support from Alberta Environment & Parks (AEP) including additional crew members to help it get finished in a record 2 1/2 days. Corridor clearing and tread work were also completed on Section G during this trip. We will continue working on the High Rock Trail in the First Creek valley in 2019. The last trip on the High Rock Trail this year took place in late September and was another first. We have been working on building a Crowsnest Chapter and this was the first trip for the newly formed Chapter, squeezed in at the last moment. 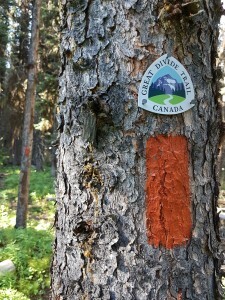 We managed to open corridor and pin flag 1.7 km of new trail south of Window Mountain Lake, that should keep the Chapter busy in 2019. Walking Trip on the Original GDT: A mark of a strong organization is its ability to focus on multiple projects at once. So even with all the trips happening on the High Rock Trail, we were able to also carry out several other trips on key sections of the GDT. In July, we held a 6-day Walking Trip on the original section of the GDT from Baril Creek to Tornado Pass, maintaining more than 90 kilometres of the centerpiece of the GDT, clearing 300 downed trees, re-building sections of washed out tread, installing new reassurance markers, and assessing future trail maintenance priorities. While the Walking Trip Crew was small (6 volunteers), the amount of work accomplished and the camaraderie built was huge! Jasper National Park: Next up was the first ever trail maintenance trip held in a National Park, working with the Jasper Trails Alliance to clear the Maligne Pass Trail in Jasper National Park. 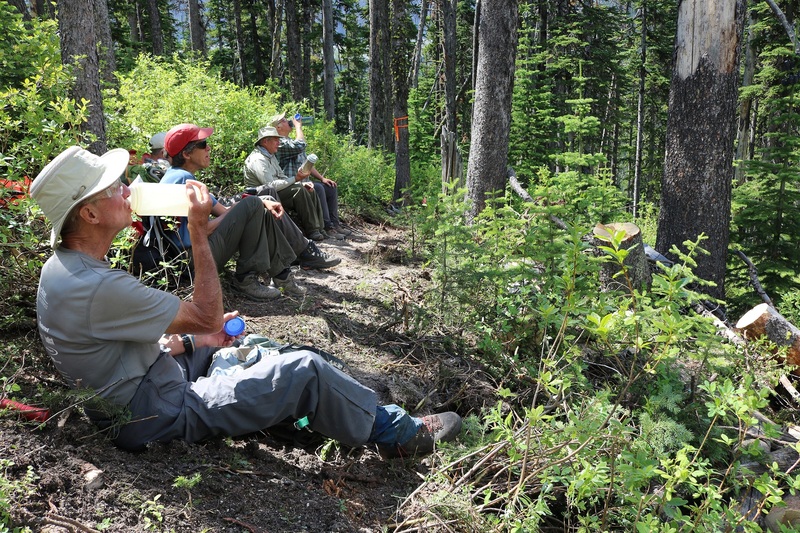 This trip was very successful, and both trail associations enjoyed and benefited from working with each other. 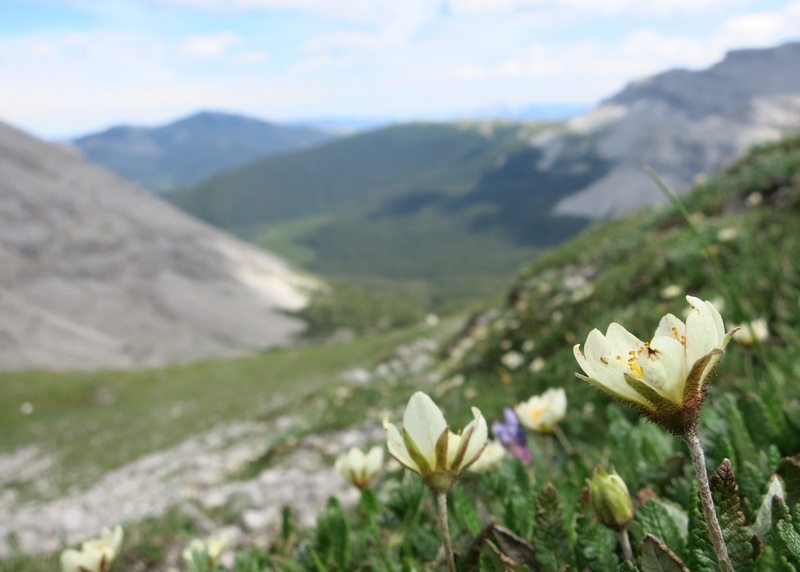 We hope this will be just the beginning of a great relationship with both the Jasper Trails Alliance and Jasper National Park. The Maligne Pass Trail is notorious for its overgrown willows that haven’t been cleared in years. So it was very rewarding to see the visual difference our efforts made to open this section of trail! 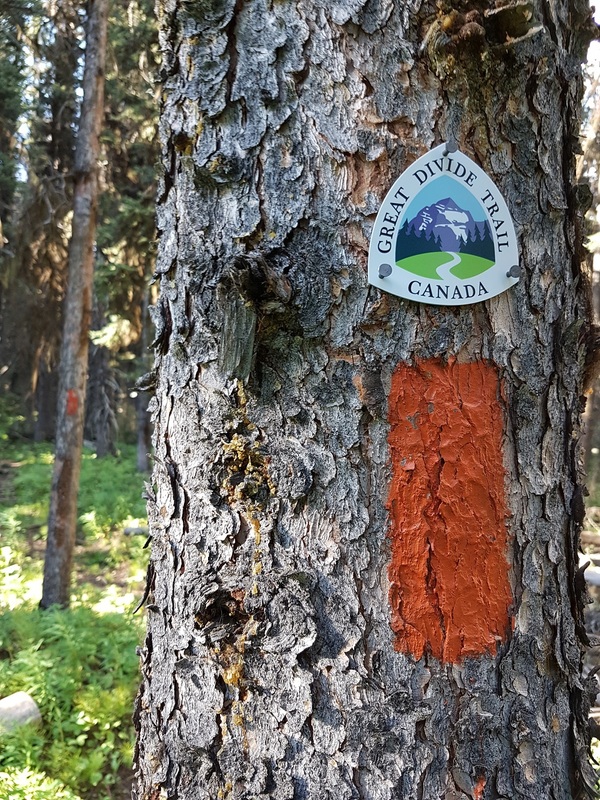 David Thompson Heritage Trail: Across the Great Divide in BC, with the signing of our partnership agreement with Recreation Sites and Trails BC, we received approval for a maintenance trip on the David Thompson Heritage Trail. Our goal was to clear and restore 8 km of the trail to its former glory. 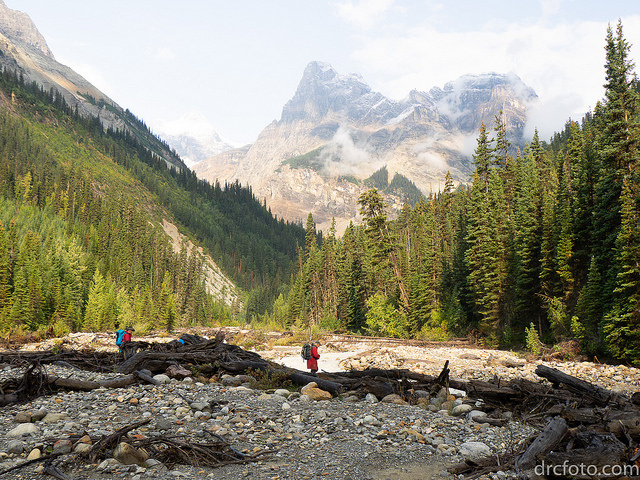 Camp was set up near the confluence of Cairnes Creek with the Blaeberry River, but the trail is located on the north side of Cairnes Creek, a fast moving glacial flow. 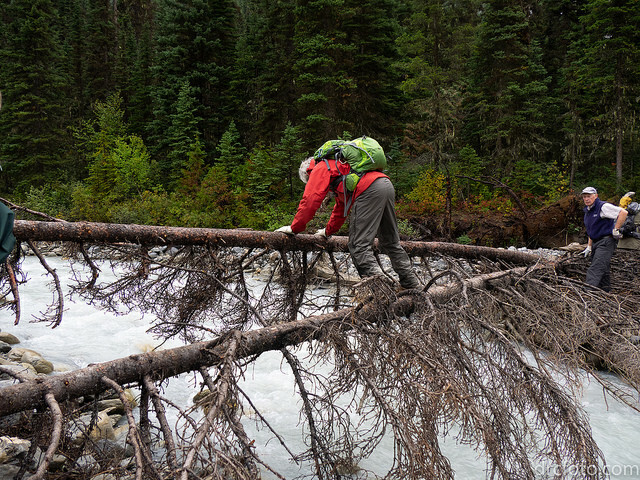 This obstacle was crossed twice each day (there and back) across two conveniently fallen tree. This trail hadn’t been maintained in more than 20 years and was in very bad condition, with sections of the trail being consumed by the nearby river. 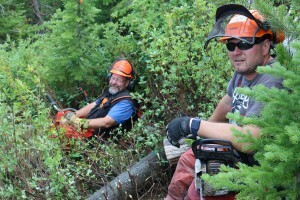 Literally hundreds of blowdowns and blockages had to be removed, as well as a ton of brush as much of the route lies in forest openings and exposed areas adjacent to the river where good sunlight and moisture have promoted a dense undergrowth of willow, rhododendron, alder and other understory shrubs. The trail was also re-routed around several washouts where new tread was built. 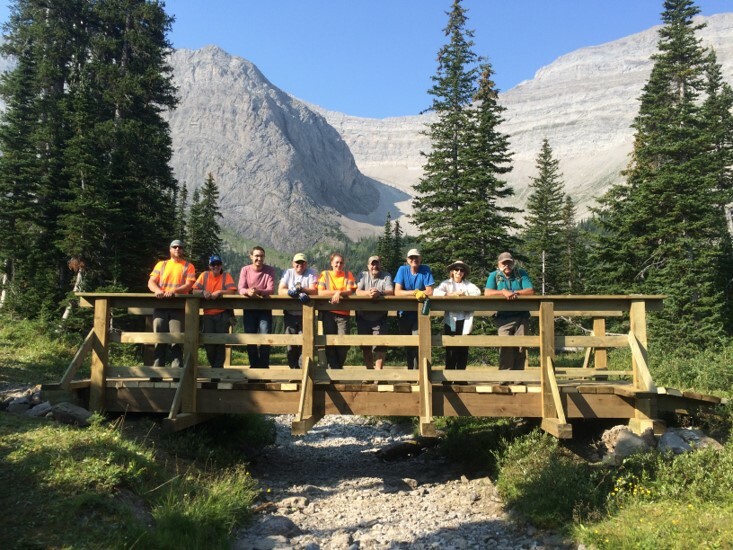 Our goal was to keep any new trail constructed as close as practicable to the location of the original, and to maintain the character and “feel” of the original historic trail to the greatest extent possible, and this was accomplished extremely well! Everyone agreed that it was immensely satisfying to experience the results of our three work days first-hand, not only from the perspective of hikers who would no longer have to laboriously route-find their way through the valley, but also in the knowledge that a nationally significant historic resource was now (at least partially) restored. 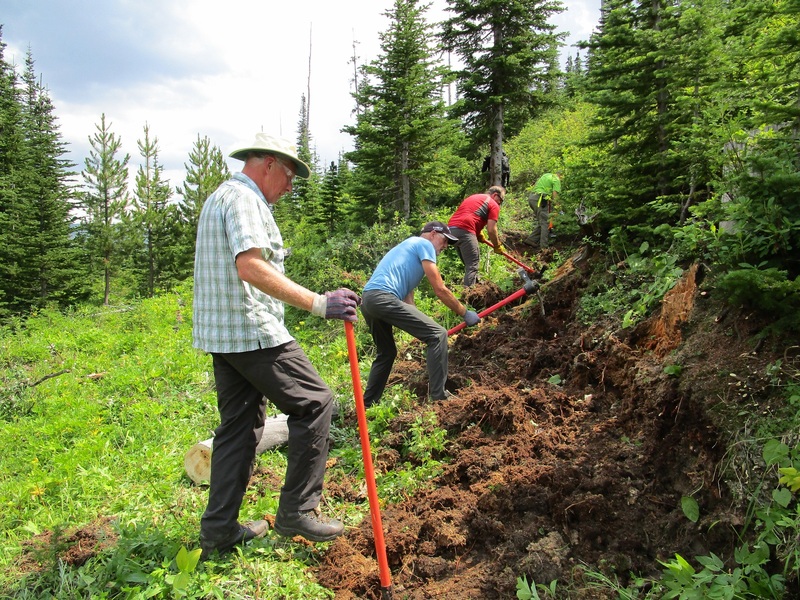 There was much discussion about returning in 2019 to complete the restoration on the final 5 km to Howse Pass. Thank you! 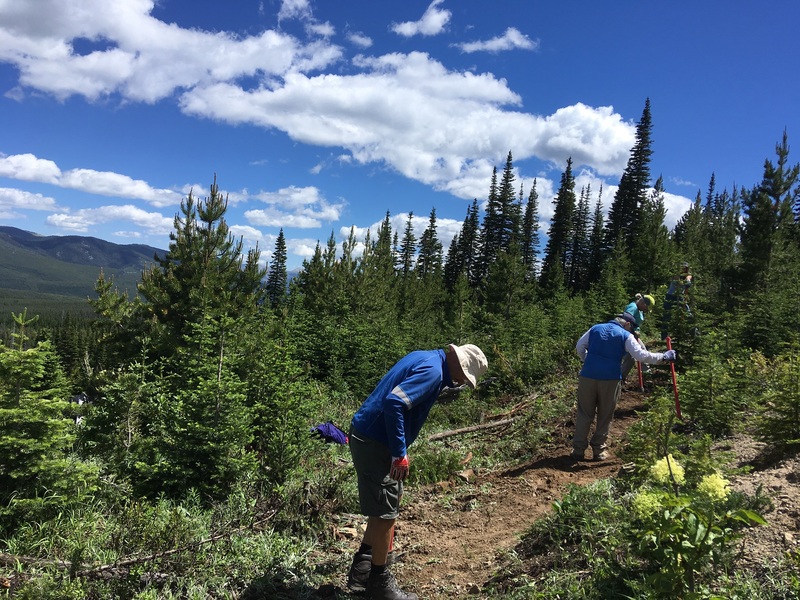 – Special thanks go out to all of our hard-working volunteers who built, maintained or mapped the trail this year, and everyone who spent countless hours over the winter months getting official authorizations, planning and making sure these trips went smoothly. Well done! 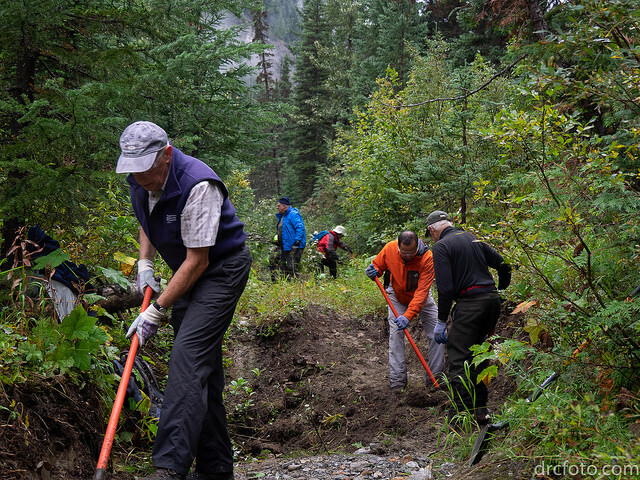 And thanks to our sponsors and partners whose generous donations and support were a huge part of our successful trail work in 2018: MEC, Teck, The North Face, Stihl, Alberta Environment and Parks, Recreation Sites and Trails BC, and the Jasper Trails Alliance.